Shirts With Random Triangles: Mississippi St. Adds 3-Star WR Kymbotric Mason To Its 2017 Recruiting Class. Mississippi St. Adds 3-Star WR Kymbotric Mason To Its 2017 Recruiting Class. Kymbotric Mason. Image via campussports.net. Mississippi State has added a fourteenth prospect to its 2017 recruiting class. 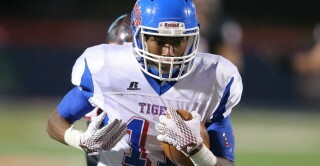 Macon, Mississippi high school rising senior wide receiver Kymbotric Mason committed to the Bulldogs on Sunday. Scout.com grades Mason as a three-star wide receiver prospect. The recruiting side ranks Mason at no. 127 among WR prospects for 2017. Mason attends Noxubee County High School in Macon, Ms. He stands 6'2, and weighs 175 lbs.